A histogram is a special type of column statistic that provides more detailed information about the data distribution in a table column. A histogram sorts values into "buckets," as you might sort coins into buckets. By default the optimizer assumes a uniform distribution of rows across the distinct values in a column. For columns that contain data skew (a nonuniform distribution of data within the column), a histogram enables the optimizer to generate accurate cardinality estimates for filter and join predicates that involve these columns. For example, a California-based book store ships 95% of the books to California, 4% to Oregon, and 1% to Nevada. The book orders table has 300,000 rows. A table column stores the state to which orders are shipped. A user queries the number of books shipped to Oregon. Without a histogram, the optimizer assumes an even distribution of 300000/3 (the NDV is 3), estimating cardinality at 100,000 rows. With this estimate, the optimizer chooses a full table scan. With a histogram, the optimizer calculates that 4% of the books are shipped to Oregon, and chooses an index scan. If DBMS_STATS gathers statistics for a table, and if queries have referenced the columns in this table, then Oracle Database creates histograms automatically as needed according to the previous query workload. A user queries the table. The database notes the predicates in the preceding query and updates the data dictionary table SYS.COL_USAGE$. You run DBMS_STATS again, causing DBMS_STATS to query SYS.COL_USAGE$ to determine which columns require histograms based on the previous query workload. As queries change over time, DBMS_STATS may change which statistics it gathers. For example, even if the data in a table does not change, queries and DBMS_STATS operations can cause the plans for queries that reference these tables to change. If you gather statistics for a table and do not query the table, then the database does not create histograms for columns in this table. For the database to create the histograms automatically, you must run one or more queries to populate the column usage information in SYS.COL_USAGE$. Oracle Database uses several criteria to determine which histogram to create: frequency, top frequency, height-balanced, or hybrid. This represents the number of distinct values in a column. For example, if a column only contains the values 100, 200, and 300, then the NDV for this column is 3. This variable represents the number of histogram buckets. The default is 254. This variable represents an internal percentage threshold that is equal to (1–(1/n)) * 100. For example, if n = 254, then p is 99.6. An additional criterion is whether the estimate_percent parameter in the DBMS_STATS statistics gathering procedure is set to AUTO_SAMPLE_SIZE (default). The following diagram shows the decision tree for histogram creation. Description of "Figure 11-1 Decision Tree for Histogram Creation"
For histograms, the algorithm for cardinality depends on factors such as the endpoint numbers and values, and whether column values are popular or nonpopular. An endpoint number is a number that uniquely identifies a bucket. In frequency and hybrid histograms, the endpoint number is the cumulative frequency of all values included in the current and previous buckets. For example, a bucket with endpoint number 100 means the total frequency of values in the current and all previous buckets is 100. In height-balanced histograms, the optimizer numbers buckets sequentially, starting at 0 or 1. In all cases, the endpoint number is the bucket number. 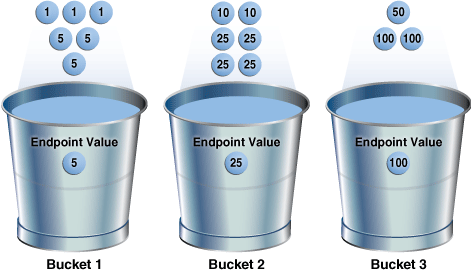 An endpoint value is the highest value in the range of values in a bucket. For example, if a bucket contains only the values 52794 and 52795, then the endpoint value is 52795. A popular value occurs as an endpoint value of multiple buckets. The optimizer determines whether a value is popular by first checking whether it is the endpoint value for a bucket. If so, then for frequency histograms, the optimizer subtracts the endpoint number of the previous bucket from the endpoint number of the current bucket. Hybrid histograms already store this information for each endpoint individually. If this value is greater than 1, then the value is popular. The optimizer calculates density using an internal algorithm based on factors such as the number of buckets and the NDV. Density is expressed as a decimal number between 0 and 1. Values close to 1 indicate that the optimizer expects many rows to be returned by a query referencing this column in its predicate list. Values close to 0 indicate that the optimizer expects few rows to be returned. Several buckets are "missing." Originally, buckets 2 through 6 each contained a single instance of value 52793. The optimizer compressed all of these buckets into the bucket with the highest endpoint number (bucket 6), which now contains 5 instances of value 52793. This value is popular because the difference between the endpoint number of the current bucket (6) and the previous bucket (1) is 5. Thus, before compression the value 52793 was the endpoint for 5 buckets. In a frequency histogram, each distinct column value corresponds to a single bucket of the histogram. Because each value has its own dedicated bucket, some buckets may have many values, whereas others have few. An analogy to a frequency histogram is sorting coins so that each individual coin initially gets its own bucket. For example, the first penny is in bucket 1, the second penny is in bucket 2, the first nickel is in bucket 3, and so on. You then consolidate all the pennies into a single penny bucket, all the nickels into a single nickel bucket, and so on with the remainder of the coins. Frequency histograms depend on the number of requested histogram buckets. NDV is less than or equal to n, where n is the number of histogram buckets (default 254). For example, the sh.countries.country_subregion_id column has 8 distinct values, ranging sequentially from 52792 to 52799. If n is the default of 254, then the optimizer creates a frequency histogram because 8 <= 254. The estimate_percent parameter in the DBMS_STATS statistics gathering procedure is set to either a user-specified value or to AUTO_SAMPLE_SIZE. Starting in Oracle Database 12c, if the sampling size is the default of AUTO_SAMPLE_SIZE, then the database creates frequency histograms from a full table scan. For all other sampling percentage specifications, the database derives frequency histograms from a sample. In releases earlier than Oracle Database 12c, the database gathered histograms based on a small sample, which meant that low-frequency values often did not appear in the sample. Using density in this case sometimes led the optimizer to overestimate selectivity. This scenario shows how to generate a frequency histogram using the sample schemas. This scenario assumes that you want to generate a frequency histogram on the sh.countries.country_subregion_id column. This table has 23 rows. Gather statistics for sh.countries and the country_subregion_id column, letting the number of buckets default to 254. Query the histogram information for the country_subregion_id column. The optimizer chooses a frequency histogram because n or fewer distinct values exist in the column, where n defaults to 254. Query the endpoint number and endpoint value for the country_subregion_id column. Figure 11-2 is a graphical illustration of the 8 buckets in the histogram. Each value is represented as a coin that is dropped into a bucket. Description of "Figure 11-2 Frequency Histogram"
As shown in Figure 11-2, each distinct value has its own bucket. Because this is a frequency histogram, the endpoint number is the cumulative frequency of endpoints. For 52793, the endpoint number 6 indicates that the value appears 5 times (6 - 1). For 52794, the endpoint number 8 indicates that the value appears 2 times (8 - 6). Buckets 1, 9, and 10 contain nonpopular values. The optimizer estimates their cardinality based on density. A top frequency histogram is a variation on a frequency histogram that ignores nonpopular values that are statistically insignificant. For example, if a pile of 1000 coins contains only a single penny, then you can ignore the penny when sorting the coins into buckets. A top frequency histogram can produce a better histogram for highly popular values. If a small number of values occupies most of the rows, then creating a frequency histogram on this small set of values is useful even when the NDV is greater than the number of requested histogram buckets. To create a better quality histogram for popular values, the optimizer ignores the nonpopular values and creates a top frequency histogram. NDV is greater than n, where n is the number of histogram buckets (default 254). The percentage of rows occupied by the top n frequent values is equal to or greater than threshold p, where p is (1-(1/n))*100. The estimate_percent parameter in the DBMS_STATS statistics gathering procedure is set to AUTO_SAMPLE_SIZE. This scenario shows how to generate a top frequency histogram using the sample schemas. This scenario assumes that you want to generate a top frequency histogram on the sh.countries.country_subregion_id column. This table has 23 rows. Gather statistics for sh.countries and the country_subregion_id column, specifying fewer buckets than distinct values. The sh.countries.country_subregion_id column contains 8 distinct values, but the histogram only contains 7 buckets, making n=7. In this case, the database can only create a top frequency or hybrid histogram. In the country_subregion_id column, the top 7 most frequent values occupy 95.6% of the rows, which exceeds the threshold of 85.7%, generating a top frequency histogram (see "Criteria For Frequency Histograms"). Query the endpoint number and endpoint value for the column. Figure 11-3 is a graphical illustration of the 7 buckets in the top frequency histogram. The values are represented in the diagram as coins. Description of "Figure 11-3 Top Frequency Histogram"
As shown in Figure 11-3, each distinct value has its own bucket except for 52795, which is excluded from the histogram because it is nonpopular and statistically insignificant. As in a standard frequency histogram, the endpoint number represents the cumulative frequency of values. In a legacy height-balanced histogram, column values are divided into buckets so that each bucket contains approximately the same number of rows. For example, if you have 99 coins to distribute among 4 buckets, each bucket contains about 25 coins. The histogram shows where the endpoints fall in the range of values. Before Oracle Database 12c, the database created a height-balanced histogram when the NDV was greater than n. This type of histogram was useful for range predicates, and equality predicates on values that appear as endpoints in at least two buckets. The estimate_percent parameter in the DBMS_STATS statistics gathering procedure is not set to AUTO_SAMPLE_SIZE. It follows that if Oracle Database 12c creates new histograms, and if the sampling percentage is AUTO_SAMPLE_SIZE, then the histograms are either top frequency or hybrid, but not height-balanced. If the sampling percentage is AUTO_SAMPLE_SIZE, then the database creates either hybrid or frequency histograms. If the sampling percentage is not AUTO_SAMPLE_SIZE, then the database creates either height-balanced or frequency histograms. This scenario shows how to generate a height-balanced histogram using the sample schemas. This scenario assumes that you want to generate a height-balanced histogram on the sh.countries.country_subregion_id column. This table has 23 rows. To simulate Oracle Database 11g behavior, which is necessary to create a height-based histogram, set estimate_percent to a nondefault value. If you specify a nondefault percentage, then the database creates frequency or height-balanced histograms. The optimizer chooses a height-balanced histogram because the number of distinct values (8) is greater than the number of buckets (7), and the estimate_percent value is nondefault. Query the number of rows occupied by each distinct value. Figure 11-4 is a graphical illustration of the height-balanced histogram. The values are represented in the diagram as coins. Description of "Figure 11-4 Height-Balanced Histogram"
The bucket number is identical to the endpoint number. 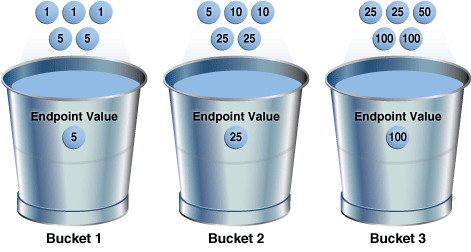 The optimizer records the value of the last row in each bucket as the endpoint value, and then checks to ensure that the minimum value is the endpoint value of the first bucket, and the maximum value is the endpoint value of the last bucket. In this example, the optimizer adds bucket 0 so that the minimum value 52792 is the endpoint of a bucket. The optimizer must evenly distribute 23 rows into the 7 specified histogram buckets, so each bucket contains approximately 3 rows. However, the optimizer compresses buckets with the same endpoint. So, instead of bucket 1 containing 2 instances of value 52793, and bucket 2 containing 3 instances of value 52793, the optimizer puts all 5 instances of value 52793 into bucket 2. Similarly, instead of having buckets 5, 6, and 7 contain 3 values each, with the endpoint of each bucket as 52799, the optimizer puts all 9 instances of value 52799 into bucket 7. In this example, buckets 3 and 4 contain nonpopular values because the difference between the current endpoint number and previous endpoint number is 1. The optimizer calculates cardinality for these values based on density. The remaining buckets contain popular values. The optimizer calculates cardinality for these values based on endpoint numbers. A hybrid histogram combines characteristics of both height-based histograms and frequency histograms. This "best of both worlds" approach enables the optimizer to obtain better selectivity estimates in some situations. The height-based histogram sometimes produces inaccurate estimates for values that are almost popular. For example, a value that occurs as an endpoint value of only one bucket but almost occupies two buckets is not considered popular. To solve this problem, a hybrid histogram distributes values so that no value occupies more than one bucket, and then stores the endpoint repeat count value, which is the number of times the endpoint value is repeated, for each endpoint (bucket) in the histogram. By using the repeat count, the optimizer can obtain accurate estimates for almost popular values. 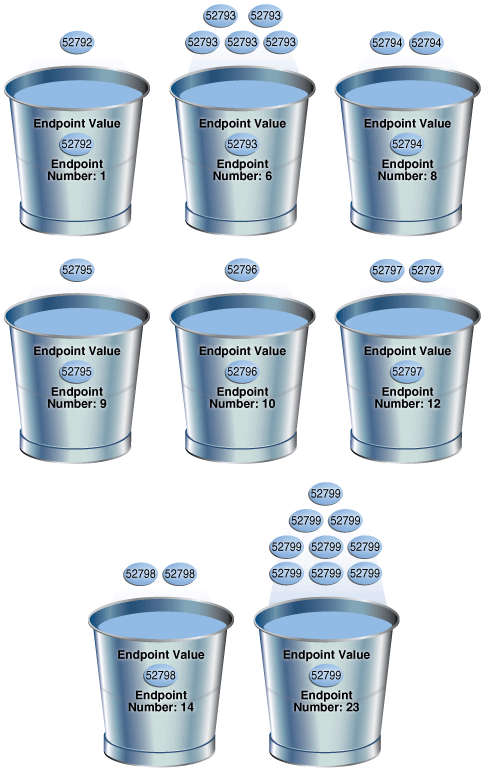 The analogy of coins distributed among buckets illustrate show endpoint repeat counts work. The following figure illustrates a coins column that sorts values from low to high. Description of "Figure 11-5 Coins"
You gather statistics for this table, setting the method_opt argument of DBMS_STATS.GATHER_TABLE_STATS to FOR ALL COLUMNS SIZE 3. In this case, the optimizer initially groups the values in the coins column into three buckets, as shown in the following figure. Description of "Figure 11-6 Initial Distribution of Values"
If a bucket border splits a value so that some occurrences of the value are in one bucket and some in another, then the optimizer shifts the bucket border (and all other following bucket borders) forward to include all occurrences of the value. For example, the optimizer shifts value 5 so that it is now wholly in the first bucket, and the value 25 is now wholly in the second bucket. 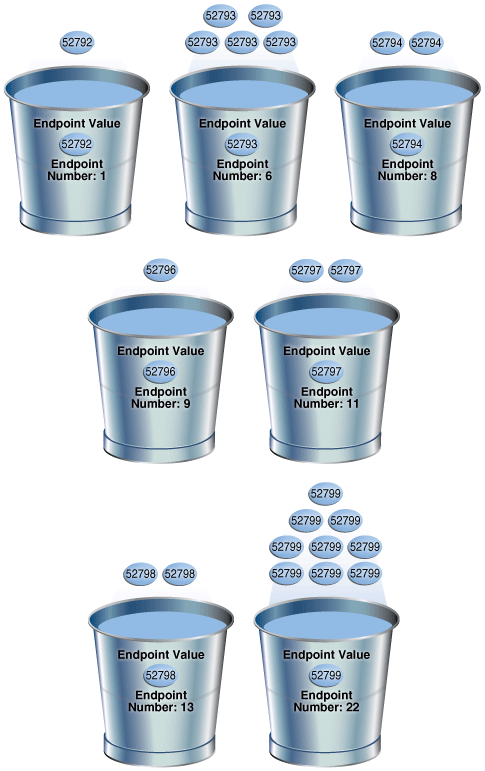 Description of "Figure 11-7 Redistribution of Values"
The endpoint repeat count measures the number of times that the corresponding bucket endpoint, which is the value at the right bucket border, repeats itself. For example, in the first bucket, the value 5 is repeated 3 times, so the endpoint repeat count is 3. Description of "Figure 11-8 Endpoint Repeat Count"
Height-balanced histograms do not store as much information as hybrid histograms. By using repeat counts, the optimizer can determine exactly how many occurrences of an endpoint value exist. For example, the optimizer knows that the value 5 appears 3 times, the value 25 appears 4 times, and the value 100 appears 2 times. This frequency information helps the optimizer to generate better cardinality estimates. The only differentiating criterion for hybrid histograms as compared to top frequency histograms is that the top n frequent values is less than internal threshold p.
NDV is greater than n, where n is the number of histogram buckets (default is 254). The criteria for top frequency histograms do not apply. This is another way to stating that the percentage of rows occupied by the top n frequent values is less than threshold p, where p is (1-(1/n))*100. See "Criteria For Top Frequency Histograms." If users specify their own percentage, then the database creates frequency or height-balanced histograms. This scenario shows how to generate a hybrid histogram using the sample schemas. This scenario assumes that you want to generate a hybrid histogram on the sh.products.prod_subcategory_id column. This table has 72 rows. The prod_subcategory_id column contains 22 distinct values. Gather statistics for sh.products and the prod_subcategory_id column, specifying 10 buckets. The column contains 22 distinct values. Because the number of buckets (10) is less than 22, the optimizer cannot create a frequency histogram. The optimizer considers both hybrid and top frequency histograms. To qualify for a top frequency histogram, the percentage of rows occupied by the top 10 most frequent values must be equal to or greater than threshold p, where p is (1-(1/10))*100, or 90%. However, in this case the top 10 most frequent values occupy 54 rows out of 72, which is only 75% of the total. Therefore, the optimizer chooses a hybrid histogram because the criteria for a top frequency histogram do not apply. Query the endpoint number, endpoint value, and endpoint repeat count for the country_subregion_id column. In a height-based histogram, the optimizer would evenly distribute 72 rows into the 10 specified histogram buckets, so that each bucket contains approximately 7 rows. Because this is a hybrid histogram, the optimizer distributes the values so that no value occupies more than one bucket. For example, the optimizer does not put some instances of value 2036 into one bucket and some instances of this value into another bucket: all instances are in bucket 36. The endpoint repeat count shows the number of times the highest value in the bucket is repeated. By using the endpoint number and repeat count for these values, the optimizer can estimate cardinality. For example, bucket 36 contains instances of values 2033, 2034, 2035, and 2036. 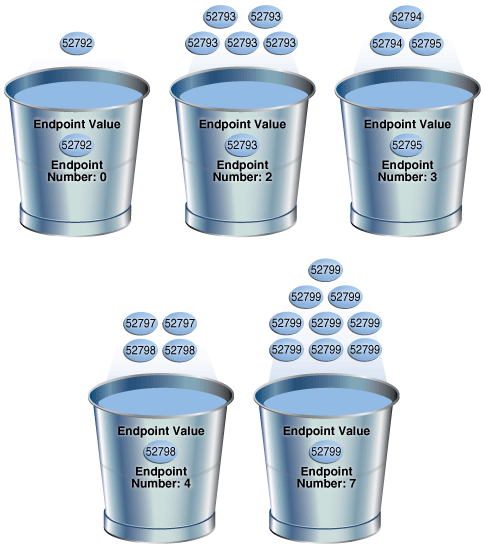 The endpoint value 2036 has an endpoint repeat count of 4, so the optimizer knows that 4 instances of this value exist. For values such as 2033, which are not endpoints, the optimizer estimates cardinality using density.